Cherries are a rich source of anthocyanins – plant pigments responsible for the colour of many fruits including cherries. Anthocyanins are potent antioxidants that have been associated with a variety of health benefits. 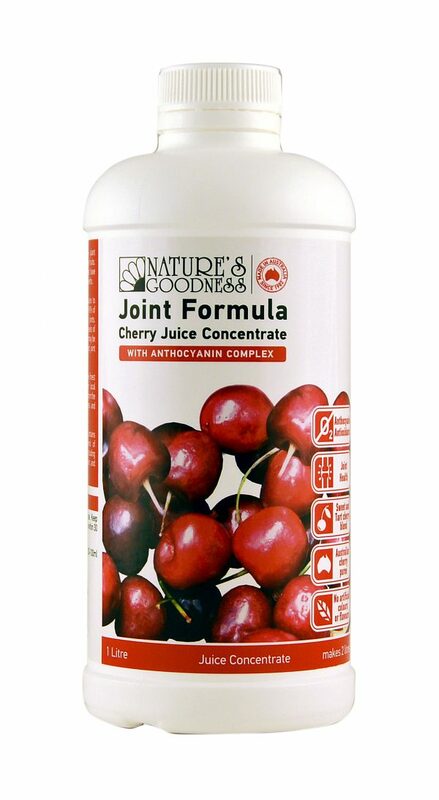 Nature’s Goodness Joint Formula also contains Anthocyanin Complex – a potent blend of anthocyanin-rich Australian native fruits including Wild Rosella, Davidson Plum, Illawarra Plum, and Mountain Pepper. Store below 30°C. Shake well before use. Keep refrigerated after opening. Best consumed within 30 days of opening. Dilute Cherry Juice with an equal amount of water. Use 30 – 100mL or as required.